Easton Gallaher displays the trading card he received of 11th grade wrestler, Brendan Foerster. This winter, children in kindergarten through grade 2 got a unique opportunity to learn about wrestling from high school students. “Wrestling for Fun” is a high energy, introductory program designed to teach the basics of wrestling. The practices started in January and they are run by coaching staff and the entire high school wrestling team. The program is open to local districts and about 90% of participants are Camp Hill students. The practices are designed to be instructional rather than competitive. Head Coach Chad Gallaher models basic wrestling moves and then each high school student works with a group of kids to practice the moves. Through their hard work and effort, the high school wrestlers serve as excellent role models and they enjoy getting to know the younger students. While the main goal of the program is to provide basic wrestling instruction for those interested, it is great to see students building connections. It also provides an opportunity for parents to observe high school students making a positive impact. 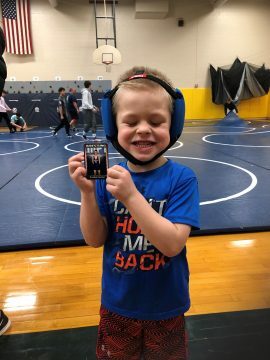 At the end of every practice, the elementary students receive a special prize – the trading card of that week’s featured wrestler from the high school team. They are encouraged to collect the whole set by attending all of the practices. This is exciting for the high school students too because they don’t know when they will be featured. The “Wrestling for Fun” program began in Camp Hill about 18 years ago and has served as a foundation for many students. Eight of the twenty wrestlers on the current high school team participated in the program as kids. For these students, the positive impact of the program has come full circle.